This subject has become a regretted annual event with astronomers since 2003, when it first appeared in emails and on social media. 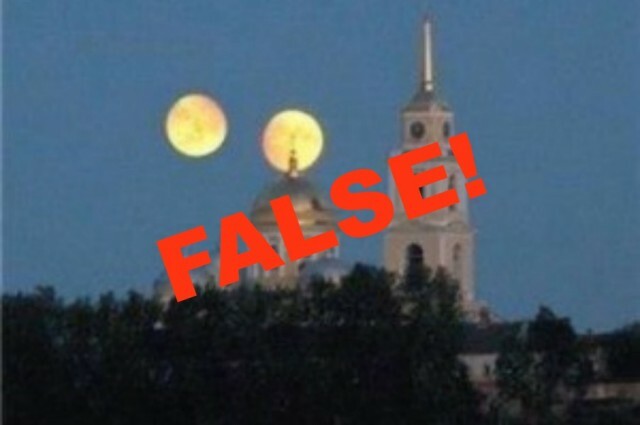 We'’ve since seen many amateur and professional astronomy websites trying to address this ongoing urban legend scourge. And since we are amateur astronomers, we invariably end up getting sent notices and emails each year around August asking us about this “"once in a lifetime” event"? This is our attempt to inform people of the facts. Mars is not as big as the Moon in the sky. Mars can never be as big as the Moon in the sky. You need a decent telescope to even see Mars as a disk instead of little orangey ball of light. If Mars looked as big as the Moon, we’d be in for a whole peck of trouble. Mars isn’t even close to the Earth in its orbit right now. We’re approaching it, like a car on the inside track at a raceway, but it’ll be January 2010 until we’re at our closest. Even then, it’ll be tens of millions of miles away. The "Aug. 27" date being referred to is actually Aug. 27, 2003. Back in 2003 Mars made a historically "close" pass by Earth that night (35 million miles, or 56 million km). That was a historically close pass and was the closest it had been in the past 50,000 years! But even then, to the naked-eye, Mars appeared as nothing more than an extremely bright yellowish-orange star, not at all like the "Full Moon" as is being claimed. In terms of actual size, Mars (approximately 4,213 miles, or 6,780 km. in diameter) is only about twice the size of our Moon (about 2,160 miles, or 3,475 km). But because of the great distance between Mars and Earth, from our vantage point, visual perspective would never allow Mars to appear anywhere near as large as the moon in our sky. The average distance of the moon from Earth is 238,000 miles (382,900 km). And Mars is roughly twice the size of the Moon. So for Mars to appear to loom as large as the Moon does from Earth, it would have to be about twice the Moon's distance, or roughly 476,000 miles (766,000 km.). Also, if Mars were actually only twice the distance from the Earth as the Moon, the gravitational influence from Mars would create horrific tidal disasters and weather. Just as the Moon creates tides that affect our weather, the tides due to Mars' gravity being so close would create havoc and global weather chaos. Mars' actual distance from the earth is on average approximately 140 million miles (225 million km). That’s MILLIONS of miles (kilometers)! Or about 102 times further away that the Moon! Take a US .50¢ half-dollar (Mars) and place it about 20 feet away (have a friend hold it or set it on something so you can see it). Next take a US .10¢ dime (Moon) and hold it at arm’s length. With the half dollar only 20 feet away and the dime at arm’s length, close one eye and look down your arm to where you can see both coins in the same field of view. You will see that the half dollar, which is about twice the size of the dime, now actually looks smaller than the dime. Now if we were REALLY going to be accurate at this scale (dimes and half dollars) you’d have to place the dime 9 feet away from you (Earth-Moon distance) and the half dollar at 1877 feet (about 1/3 of a mile) away to represent the approximate distances between the Earth, Moon and Mars. The dime is still visible at nine feet but the half dollar would be hard to see with the naked eye. This is why the Mars email is factually inaccurate. Just as every large objects appear to be smaller the further away they are; smaller objects also look larger the closer they are to the viewer. It’s called perspective.